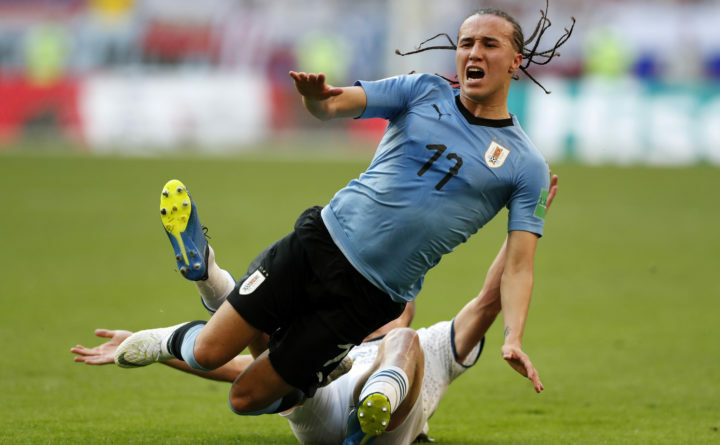 SAMARA, Russia — Luis Suarez and Edinson Cavani scored a goal each and Uruguay went on to defeat Russia 3-0 on Monday, finishing undefeated in group play and handing the host nation its first loss of the World Cup. Suarez, who seems to have put past World Cup controversies behind him, scored with a low shot from just outside the box that sailed past the wall of Russian players and into the right corner of the goal. The Barcelona striker blew a kiss to the corner of Samara Stadium where most of La Celeste’s cheering supporters were seated. SARANSK, Russia — Cristiano Ronaldo’s missed penalty cost Portugal first place in its World Cup group. Quaresma became Portugal’s oldest scorer in World Cup play by hitting a curling shot from the edge of the penalty area that went beyond the reach of diving Iran goalkeeper Ali Beiranvand. Quaresma’s goal came on a night when Ronaldo — who had scored all four Portugal goals in its first two games of Group B play — was denied on a penalty by Beiranvand. Karim Ansarifard scored a late penalty for Iran, which need to win to advance but couldn’t break through a second time despite a furious charge in the waning minutes. Spain won the group after its 2-2 draw with Morocco. Both Spain and Portugal had a goal difference of plus-1, but Spain scored six goals in its three group matches while Portugal had five. Spain will next face host Russia on Sunday in Moscow. Quaresma had never scored in a World Cup game; he had nine international goals in 78 previous appearances. But his goal had all the flare of a Ronaldo strike. He sent the shot with the outside of his right foot right into the far corner near the end of the first half. Ronaldo has now missed six of his last 14 penalty kicks. Iran has now been to five World Cups — all since 1978 — but has yet to advance out of group play. Spain, on a 23-match unbeaten run, was far from convincing in group play and again displayed defensive frailties to concede twice against a Morocco team that hadn’t scored a goal in its two previous group matches. VOLGOGRAD, Russia — The oldest person to play in a World Cup match gave up a pair of goals Monday, allowing Saudi Arabia to beat Egypt in a game between two teams that had already been eliminated. Egypt goalkeeper Essam El Hadary, who is 45, took the field for his team’s final group match to set the record. Although he gave up the two goals, he also saved a penalty in the first half. Salem Aldawsari scored with almost the last kick of the match for the Saudis, shooting from a tight angle inside the Egypt penalty area and poking the ball past El Hadary. Mohamed Salah had put Egypt ahead in the 22nd minute when he deftly controlled a long ball from Abdalla Said that split the Saudi defense and then lobbed goalkeeper Yasser Almosailem. Salman Alfaraj got the Saudis level with a penalty kick in first-half stoppage time after Ali Gabr brought down Fahad Almuwallad in the area. Saudi Arabia finished Group A in third place with three points, while Egypt was last after losing all three of its games.